Now known as Hot Springs National Park, the area is a protected watershed famous for its warm thermal springs as well as a number of cool springs. 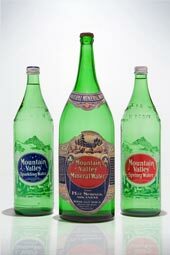 The cool spring that continues to draw nationwide attention for its purity and unique mineral content is the source of Mountain Valley Spring Water. "The value of the water has long been known, and the springs are visited by large numbers of invalids who fail to find relief from the thermal waters here, and are frequently speedily cured by the use of the Mountain Valley Spring Water alone. The shipment of this water to all parts of the country in barrels and bottles has become quite a business." By 1917, Mountain Valley Water had become well known as a remedy in the treatment of gout, rheumatism, diabetes, and kidney diseases. Some even believed the water to be radioactive because of its unexplainable curing properties. In 1921, the first clinical studies were conducted to discover the secrets of the water and its therapeutic effects. Many hospitals, doctors, and medical journals claimed their patients improved considerably after taking the water. Medical studies continued into the 1930s until interrupted by World War II. In the 1920s, Calvin Coolidge was the first president to enjoy Mountain Valley Spring Water in the White House. In 1955, after suffering a heart attack, President Dwight D. Eisenhower was advised by his physicians to drink Mountain Valley Spring Water. Both he and President Reagan used to take it on their trips abroad. All told, 13 U.S. presidents have enjoyed our water. And in the United States Senate, Mountain Valley Spring Water has been served since the 1920s. In 1966, the company was sold and the headquarters were moved to New Jersey. But in 1987, Dallas-based Sammons Enterprises bought the company and returned the headquarters to Hot Springs, Arkansas. One of the best-known structures in the historic Hot Springs downtown district, the Mountain Valley Water building underwent extensive restoration. Then-Governor Bill Clinton spoke at the re-dedication ceremony in 1988. In 2004, following the purchase of Mountain Valley by Clear Mountain Spring Water LLC of Little Rock, more renovations were begun in order to return the Visitors Center to a more historically authentic state.